The announcement by researchers at the University of Leicester was met with loud cheers at a press conference this morning. RESEARCHERS AT A British university say they have confirmed that a skeleton found under a car park is that of King Richard III who died in 1485. At a press conference this morning, archaeologists from the University of Leicester said DNA from the skeleton matches that of two of Richard III’s descendents who are alive today. The skeleton also has wounds consistent with being killed in battle in the late 15th or early 16th century, as Richard was. “It is the academic conclusion of the University of Leicester that, beyond reasonable doubt, the individual exhumed at Greyfriars in September 2012 is indeed Richard III, the last Plantagenet king of England,” lead archaeologist Richard Buckley told the press conference. The announcement was met with loud cheers from the assembled researchers. Richard III ruled England between 1483 and 1485 before he was killed in battle. He was immortalised in a play by William Shakespeare who depicted him as a hunchbacked anti-hero. 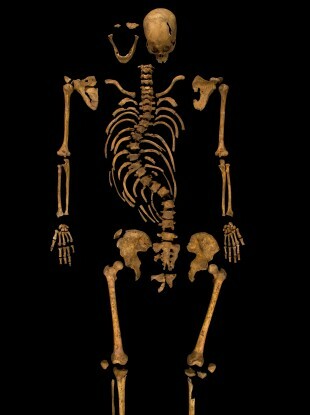 The skeleton found beneath the Leicester car park has severe scoliosis – curving of the spine – which is consistent with what is known of Richard III. The archaeologists said the body was likely to have been killed by one of two injuries to the skull, one of which possibly came from a sword. The corpse was also subjected to ‘humiliation injuries – the archaeologists found it had been impaled through the right buttock by a sword. “The skeleton has a number of unusual features: its slender build, the scoliosis and the battle-related trauma,” said Dr Jo Appleby of the University’s School of Archaeology and Ancient History. “All of these are highly consistent with the information that we have about Richard III in life and about the circumstances of his death”. The skeleton was exhumed in September 2012. The remains are to be reinterred at Leicester Cathedral. A large number of rumours surrounded Richard III, partly derived from his apparently sinister physical appearance.Perhaps the most infamous rumour about him was that he was responsible for the murder of the ‘Princes in the Tower’ – the young sons of King Edward IV, one of whom was due to be crowned king. Instead, the throne passed to Richard after their deaths. Email “Skeleton found under car park is King Richard III, say archaeologists”. Feedback on “Skeleton found under car park is King Richard III, say archaeologists”.